What is static electricity and what causes it? Everyone has experienced static electricity. Examples include: when you see a spark in the mirror combing your hair, or you touch a door knob after walking on a rug in winter. The spark you see is static electricity 'discharging. So why is it called static electricity? It's called "static" because the charges remain separated in one area rather than moving or "flowing" to another area as is the case of electricity flowing in a wire-- called current electricity. Static electricity has been known as far back as the ancient Greeks that things could be given a static electric "charge" (a buildup of static) simply by rubbing them, but they had no idea that the same energy could be used to generate light or power machines. It was Benjamin Franklin that helped bring electricity to the forefront. He believed electricity could be harnessed from lightning. What exactly is static electricity? Static electricity is basically an imbalance of electric charges within or on the surface of a material. The charge remains until it is"discharged". A static electric charge can be created whenever two surfaces contact and separate, and at least one of the surfaces has a high resistance to electric current (and is therefore an electrical insulator). The familiar spark one sees of a static shock–more specifically, is an electrostatic discharge– caused by the neutralization of charge. Where is that charge coming from? We know that all objects are made up of atoms and atoms are composed of protons, electrons and neutrons. The protons are positively charged, the electrons are negatively charged, and the neutrons are neutral. Therefore, all things are made up of charges. Opposite charges attract each other (negative to positive). Like charges repel each other (positive to positive or negative to negative). Most of the time positive and negative charges are balanced in an object, which makes that object neutral as is the case of molecules. Static electricity is the result of an imbalance between negative and positive charges in an object. These charges can build up on the surface of an object until they find a way to be released or discharged. Rubbing certain materials against one another can transfer negative charges, or electrons. For example, if you rub your shoe on the carpet, your body collects extra electrons from the rug. 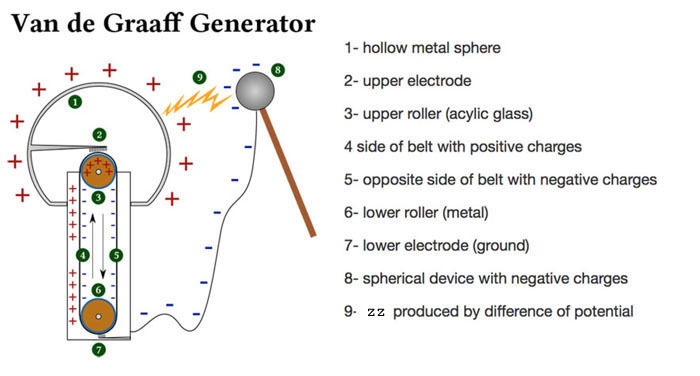 The electrons cling to your body until they can be released as the case when you touch a metal door handle. "... The phenomenon of static electricity requires a separation of positive and negative charges. When two materials are in contact, electrons may move from one material to the other, which leaves an excess of positive charge on one material, and an equal negative charge on the other. When the materials are separated they retain this charge imbalance..."
Why does your hair stand-up when removing you hat? As you remove your hat, electrons are transferred from hat to hair-- why does you hair stand up? Since objects with the same charge repel each other .As hair gains more electrons they will have the same charge and your hair will stand on end. Your hairs are simply trying to get as far away from each other as possible! What is the Triboelectric Effect? The triboelectric effect is a type of contact electrification in which certain materials become electrically charged after coming into contact with another different material, and are then separated. Most everyday static electricity is triboelectric. The polarity and strength of the charges produced differ according to the materials, surface roughness, temperature, strain, and other properties. The triboelectric effect is now considered to be related to the phenomenon of adhesion, where two materials composed of different molecules tend to stick together because of attraction between the different molecules. Chemical adhesion occurs when the surface atoms of two separate surfaces form ionic, covalent, or hydrogen bonds under these conditions there is an exchange of electrons between the different types of molecules, resulting in an electrostatic attraction between the molecules that holds them together. Depending on the triboelectric properties of the materials, one material may "capture" some of the electrons from the other material. If the two materials are now separated from each other, a charge imbalance will occur. A Van de Graaff generator is an electrostatic generator which uses a moving belt to accumulate electric charge on a hollow metal globe on the top of an insulated column. This can create very high electric potentials. It produces very high voltage direct current (DC) electricity at low current levels. It was invented by American physicist Robert J. Van de Graaff in 1929. (See Reference below in Scientific American) The potential difference achieved in modern Van de Graaff generators can reach 5 megavolts. A tabletop version can produce on the order of 100,000 volts and can store enough energy to produce a visible spark. Small Van de Graaff machines are produced for entertainment, and in physics classrooms to teach electrostatics. c) Static electricity is the result of an imbalance between negative and positive charges in an object. d) Static electricity is causes when objects of different materials come close to each other. c) Electrons are transferred from hat to hair - like charges repel so hair fibers repel. d) Neutrons are removed from both hat and hair leaving an excess of positive and negative charges.